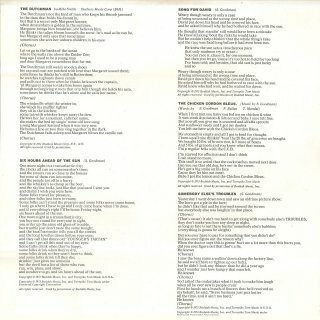 Because of the length of the 1972 page, this sub-page contains all the entries for these releases, both the original 1972-73 LP releases, tape releases, and the 1999 CD releases. 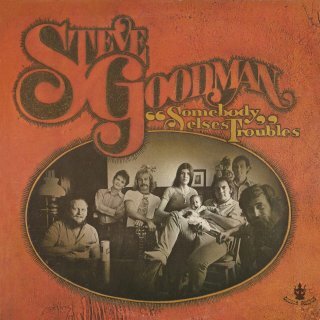 Bob took part in the Steve Goodman Somebody Else's Troubles sessions at Atlantic Recording Studio, New York, in mid-Sep 1972. 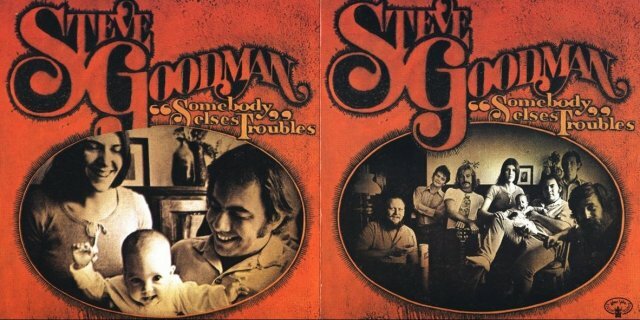 These singles copyrighted 1972 predate the release of the album in Dec 1972 below. 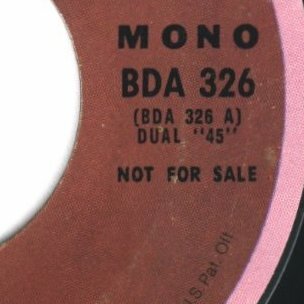 Two singles with the catalogue number BDA-326 are shown here - the first has Election Year Rag on both sides in stereo and mono, the second has the mono versions of Election Year Rag on the A-side and Somebody Else's Troubles on the B-side. 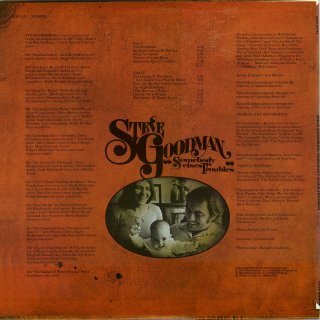 Election Year Rag was not included on the 1972 album, and first appeared on album on The Essential... Steve Goodman Buddah Records US 2LP compilation, 1976. 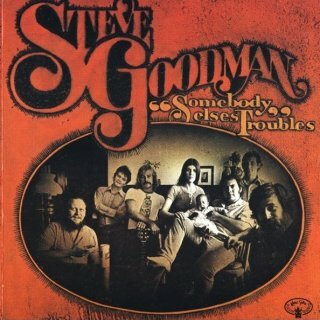 It was presumably released as an A-side to coincide with the 1972 US Presidential election, but then dropped from the album because it was no longer topical! A third single, a promo with mono and stereo versions of Somebody Else's Troubles was released in 1973 with a new catalogue number, see below. 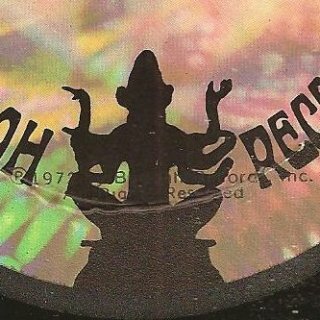 There are two variants of the mono/stereo promo 7" single shown. 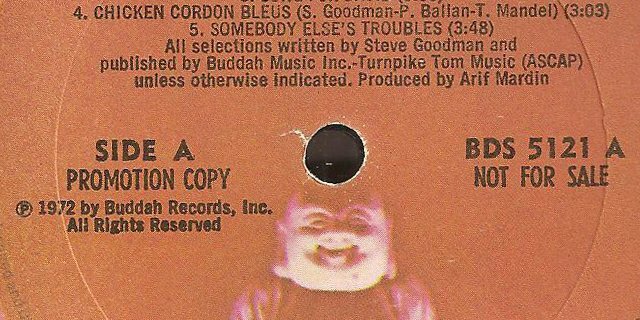 Manuel García Jara's copy does not have "NOT FOR SALE" as the bottom text line on the right of the centre hole on both sides. 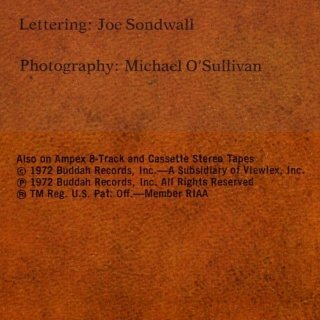 The copies shown from Hans Seegers and Kenneth Robson do have this text. 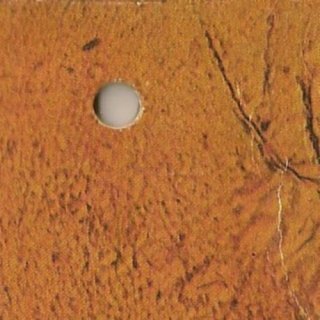 Thanks to Manuel García Jara, Tim Dunn, Hans Seegers and Lars M. Banke for information about this single and scans, and to Kenneth Robson for the photo of the second US promo single. 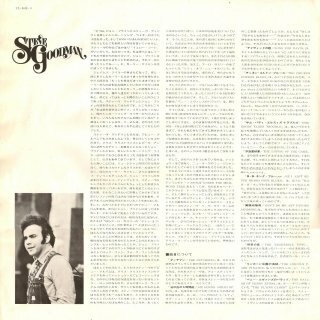 Hans Seegers points out the centre spindles were plastic and could be bought separately to fit into any "jukebox" style record, so this is not actually a variant release. 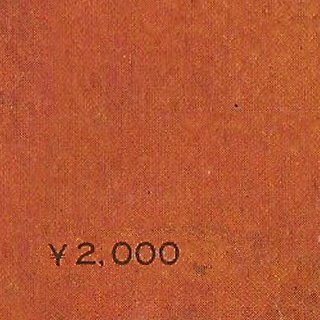 The colour difference is almost certainly due to the lighting in the photograph. 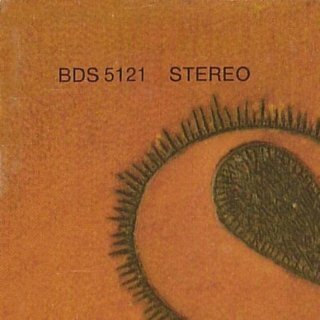 Thanks to Larry Crum for the information that the commercial single BDA 326 is actually in mono, so only the promo single had the stereo version R-0111! Buddah Records BDS 5096 (USA, 1971) - front scan by Manuel García Jara (no Dylan) Steve Goodman only recorded these two albums for Buddah Records, plus the single Election Year Rag (R-0111), making 24 tracks in total. After his death (he died of leukaemia in 1984 aged only 36) Buddah Records recycled this material in many ways, some including R-0093 and/or R-0111, some not. 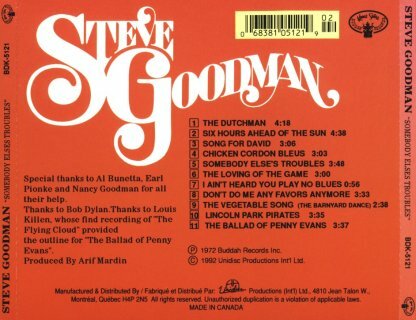 Steve subsequently signed to Asylum but his Asylum output has no Dylan content. 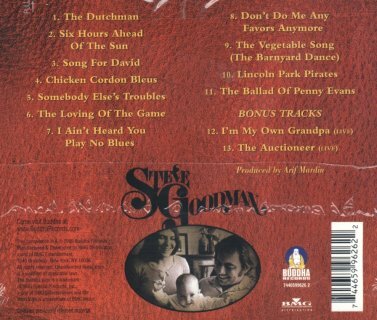 The 1994 2CD 42-track compilation on Red Pajamas Records titled No Big Surprise: The Steve Goodman Anthology also has no Dylan content. 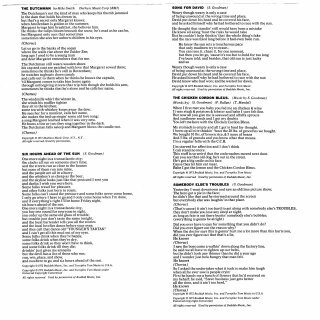 Thanks to Manuel García Jara for clarifying the situation and enabling me to put together the following definitive list of items which do include the Dylan tracks. 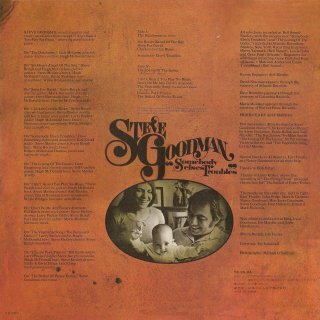 Steve Goodman (1971) - no Dylan content on first release, but re-released on CD in 1999 with R-0111 as a bonus track (in stereo), see 1999. 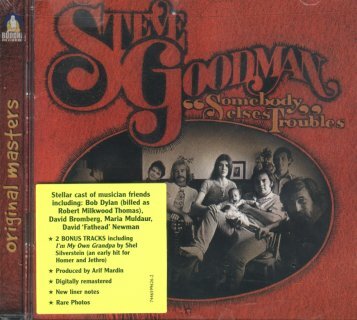 Beware, the latest remastered CD release of this album does not include R-0111! 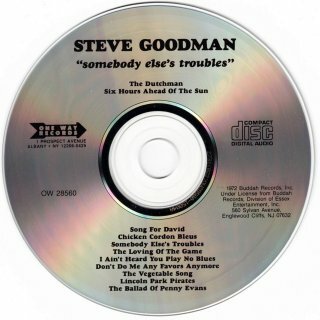 It was also released by BGO (Beat Goes On) Records in the UK in 2012 with Somebody Else's Troubles as a "2 on 1" CD but the CD only includes R-0093. 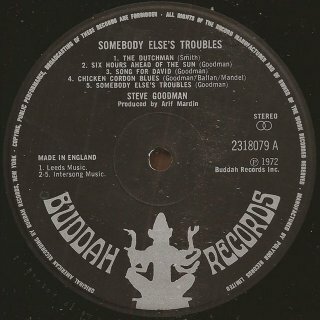 Election Year Rag/Somebody's Else's Troubles (1972) - 1972 and 1973 promo and commercial singles. 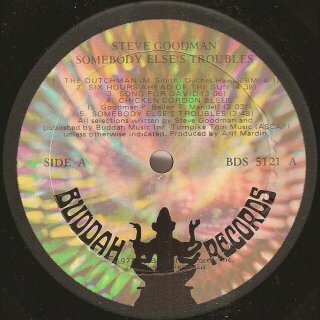 Somebody Else's Troubles (1972) - all releases of this album from Dec 1972 onwards include R-0093, but the 1990 CD release by Sequel in the UK included R-0111M as a bonus track (in mono). 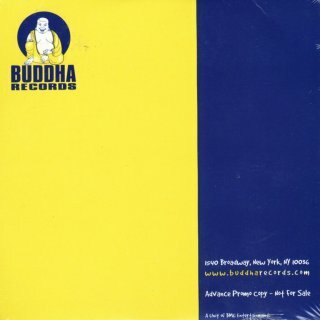 The album was subsequently released by Buddha Records in 1999 in a remastered edition with two live bonus tracks but not including R-0111M (it is therefore listed below with the original album). 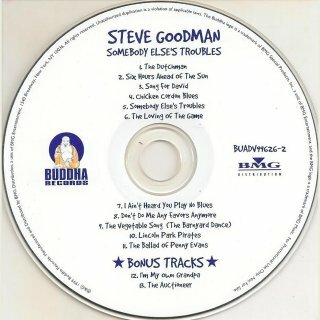 The latest 2011 Buddha Records CD release is only the original 11-track album without bonus tracks. 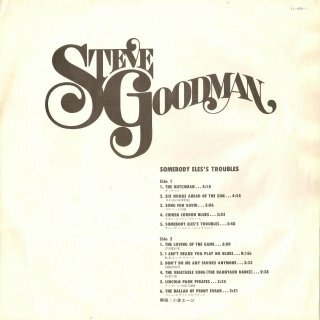 It is also available as a 2012 BGO Records UK "2 on 1" 23-track CD with Steve Goodman, again with just the original 11 tracks, not R-0111. 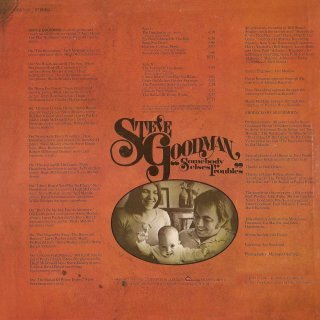 The Essential... Steve Goodman (1976) - this 20-track US 2LP set includes both R-0093 and R-0111M (still in mono), see 1976. This two LP 20-track set including both Dylan rarities was released on CD from Buddah in two versions, one on two CDs with 24 tracks (all Steve's Buddah output), and another on a single CD with just 19 tracks (catalogue numbers required!). 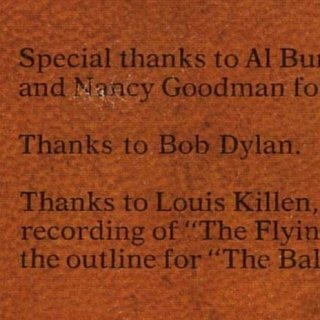 Both of these items included the two Dylan tracks, but neither is now in print. 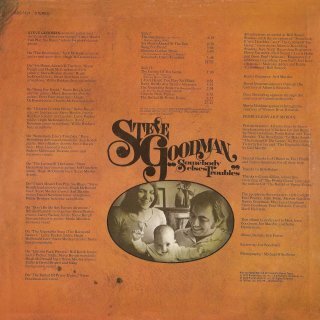 City Of New Orleans (1976) - this 23-track West German/Yugoslav 2LP set with the same gatefold sleeve and artwork as The Essential... Steve Goodman includes both Steve Goodman (on Record 1) and Somebody Else's Troubles (on Record 2) so includes R-0093, see 1976. 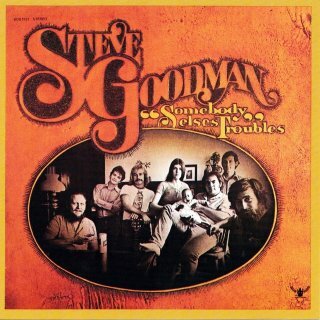 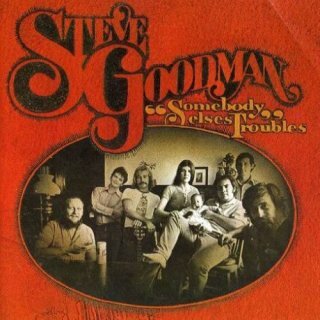 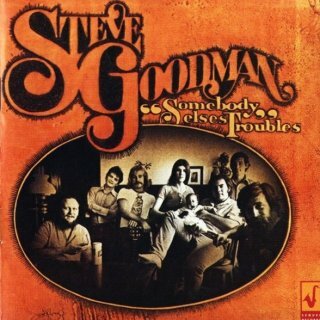 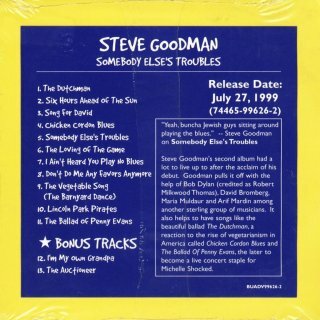 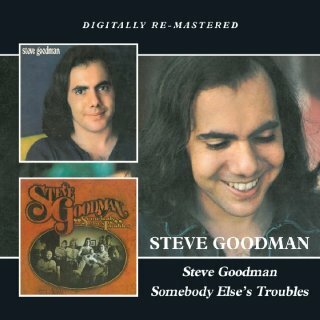 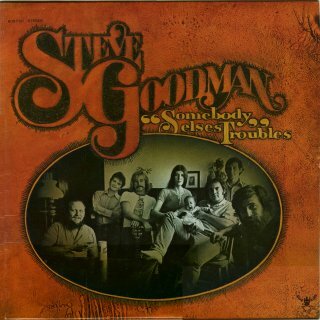 The 2012 BGO Records UK "2 on 1" CD Steve Goodman/Somebody Else's Troubles has exactly the 23 same tracks as this 2LP set! 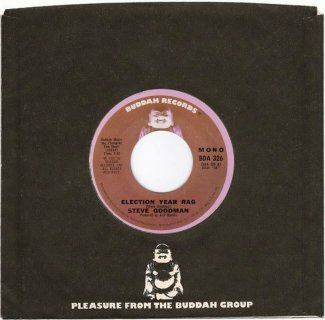 Election Year Rag /City Of New Orleans - 7" stereo West German single, see 1976. 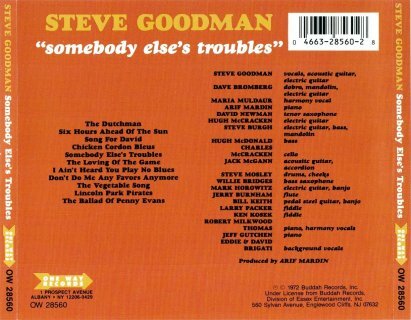 The Original Steve Goodman (1989) - this 8-track US CD/cassette compilation includes R-0093, see 1989. 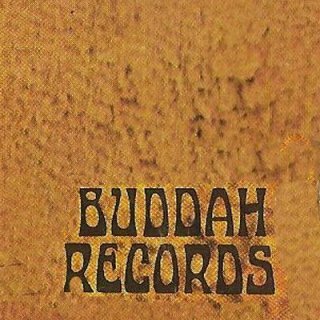 City Of New Orleans (1989) - this 19-track Buddah Records/Pair Records CD release includes R-0093 but is not the same as the 1976 release with the same name, see 1989. 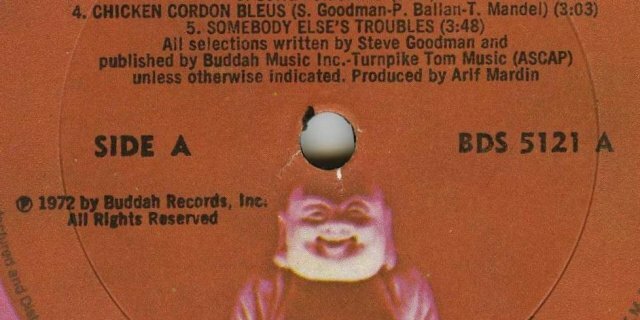 Buddah Records BDA-369 (USA) - mono side of promo 7" single, scan by Jack Guerreiro (R-0093M) This single with a later catalogue number has mono and stereo versions of the album title track in both sides. 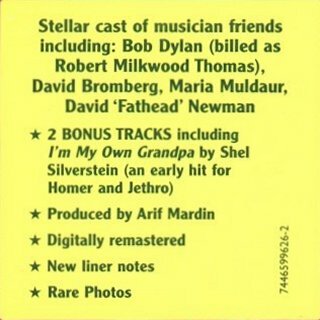 Bob appears under the name of "Robert Milkwood Thomas" (one of Dylan Thomas' best-known works is his verse play "Under Milk Wood"), although the credits include "Thanks to Bob Dylan.". 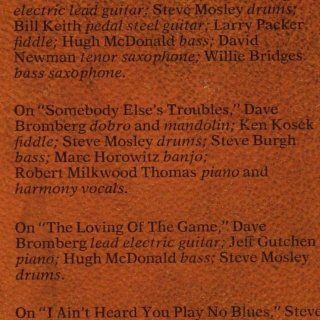 The tracks were recorded in Sep 1972. 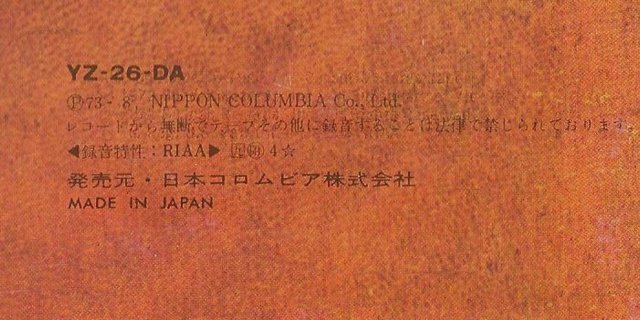 Although the album is dated 1972, my previous information was that it was not released until Jan 1973, but Manuel García Jara has a first release copy that was definitely bought in Dec 1972, so it's now listed here. 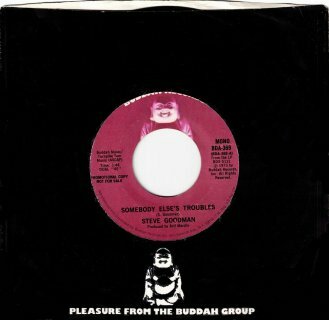 This track had previously been released on a mono US promo single, Buddah Records BDA-326, in Oct 1972, see above, and later on a mono/stereo US promo single, Buddah Records BDA-369, in 1973. 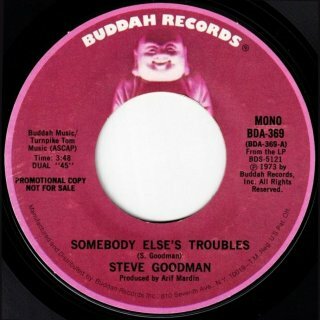 For Election Year Rag (R-0111) from this 1972 session also featuring Bob, see above, a 7" stereo West German single (1976) and The Essential... Steve Goodman Buddah Records US 2LP compilation, also 1976. 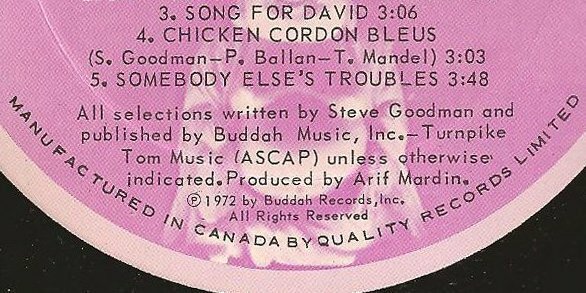 Buddah Records BDS-5121 (USA) - detail of Side 1, scan by Manuel García Jara (1972) A curiosity: the track Chicken Cordon Bleus on Side 1 has this title in all original worldwide releases, i.e. 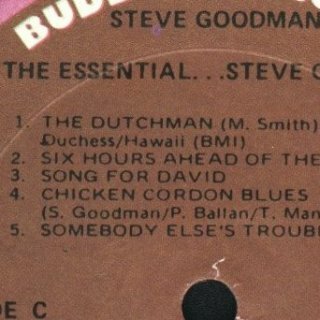 Chicken Cordon Bleus from "Cordon Bleu" (French haute cuisine). 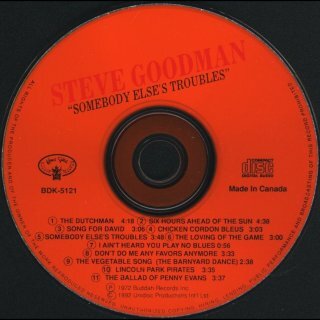 However, this track has the incorrect title Chicken Cordon Blues in all the vinyl compilations (The Essential... Steve Goodman, City Of New Orleans, Ídolos 13, for all see 1976) while on the CD reissues of this album the title is again correctly Chicken Cordon Bleus. 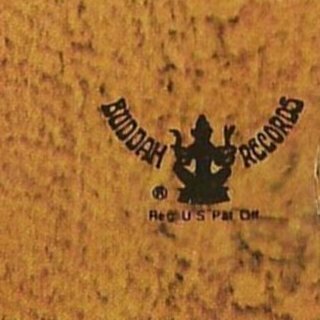 From its foundation in 1967, Buddah Records used a "kaleidoscope" design of labels and the icon was a silhouette of six-armed Shiva. 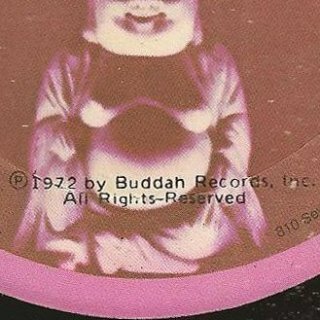 This design was used in USA until mid 1972 in singles and until Dec 1972 in albums, when a new design was used as shown here with maroon labels and a fat Buddha (the correct spelling) as logo. 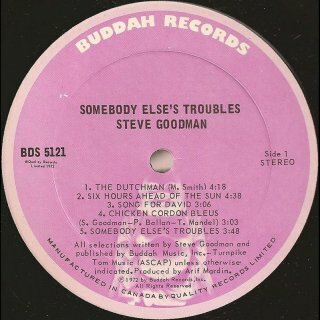 This album must have been one of the first (if not the first) Buddah Records releases with this label style! However, the first commercial release album shown here was bought in San Francisco, CA, in early Dec 1972 and has the old style Shiva design labels. 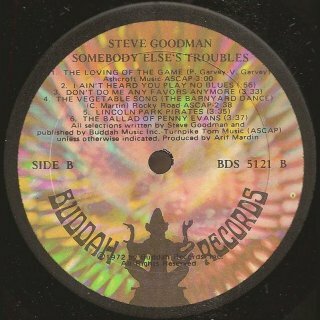 This is very rare and only a few must have been produced. 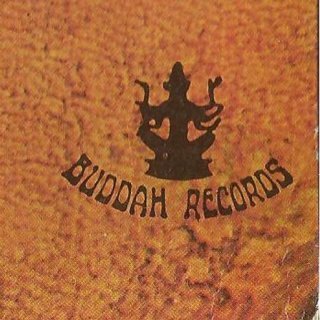 This album is Buddah Records BDS-5121 - Manuel García Jara has examples of non-Dylan Buddah albums such as BDS-5109 from 1972 where the labels have the Shiva design, and BDS-5129 or BDS-5133 from early 1973 where the labels have the new Buddha design labels. 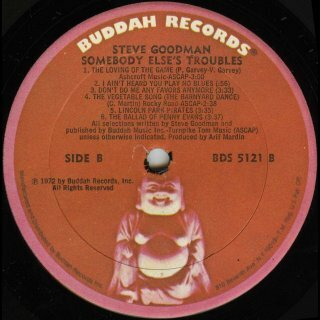 In Europe (except in UK, where Buddah records had black labels) the new design was not used until 1977. 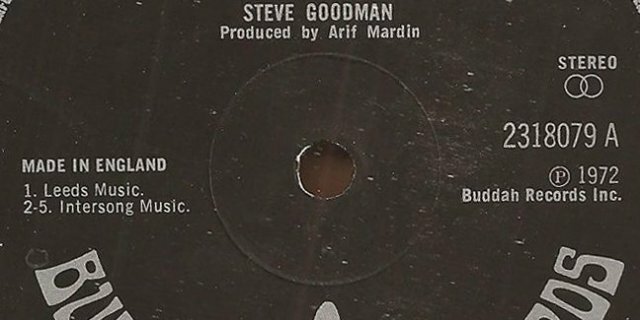 The sleeve retained the Shiva logo on the front after the label change. 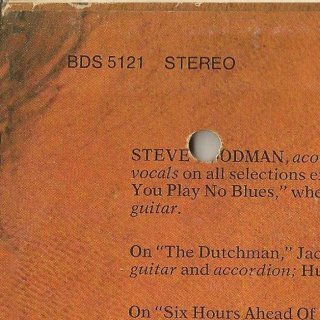 The promo copy shown of this album has a sleeve that is identical to that of the commercial release but it has a hole drilled at top right front/top left rear. This sleeve is textured and the sleeve has been made in the US composite style of the 1960s with a printed paper slick glued over the cardboard; the rear of the promo sleeve is slightly tilted to the right. 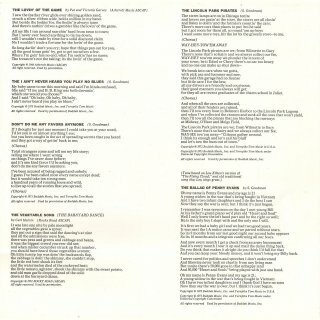 The records of the promo and all commercial copies have generic Buddah black inner sleeves and a double-sided insert with lyrics. 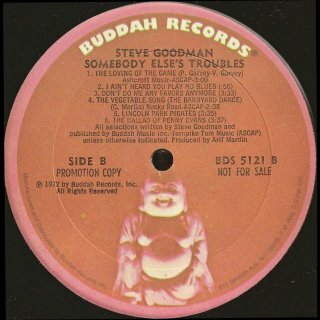 Surprisingly the promo record labels are identical to those of the second commercial release using the Buddha design with the added text "PROMOTION COPY" to the left of the centre hole and "NOT FOR SALE" to the right. 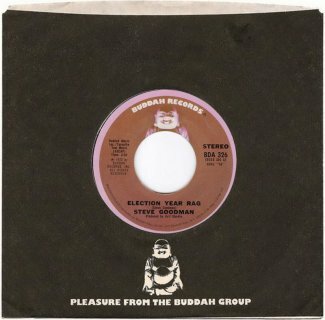 The copyright text "(P) 1972 by Buddah Records..." is now printed at the bottom of both sides of the labels, instead of below "Side A/B". 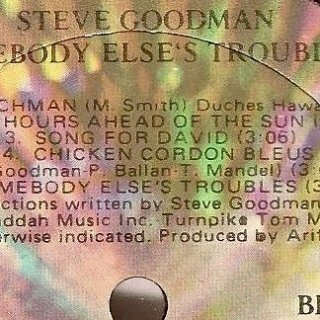 The tracklist on Side 1 has six lines, not five as in all previous releases (Chicken Cordon Bleus is now printed on two lines). 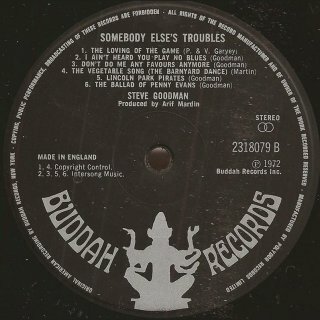 Buddah/Quality Records BDS-5121 (Canada) - front scan by Manuel García Jara The Canadian release of this album was made for Buddah by Quality Records Limited, a Canadian label which released US albums there on behalf of different record companies. 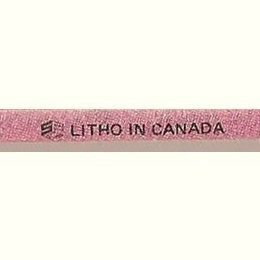 The sleeve is very similar to the US album, except for the detail shown plus "LITHO IN CANADA" on the spine. The sleeve is dated 1973. 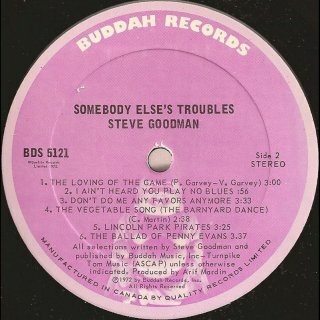 Like other Buddah albums released in Canada by Quality Records, the record has pink Buddah Records labels, in this case dated 1972. 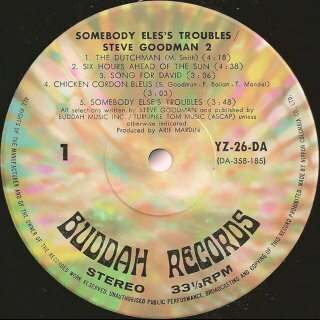 The UK release of this album was manufactured and distributed by Polydor for Buddah Records. 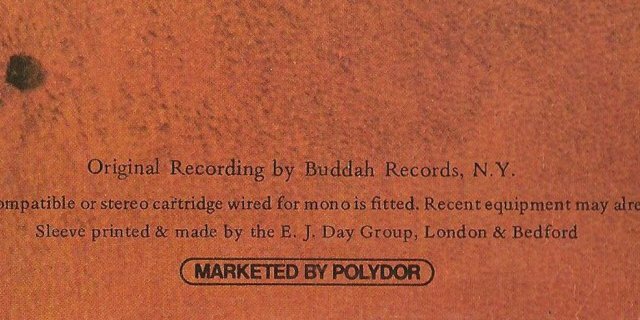 The UK catalogue number has seven digits, similar to those of other Polydor releases, e.g. 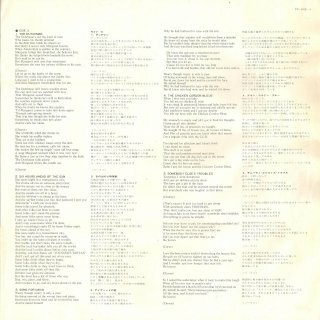 Eric Clapton's No Reason To Cry, see 1976. 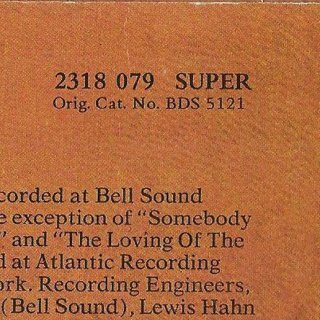 (The catalogue number is "2318 079 SUPER" on the rear sleeve and "2318079" on the record labels.) The sleeve is similar to that of the US release, but the Buddah logo is bigger and the text "Buddah Records" is in a different position. 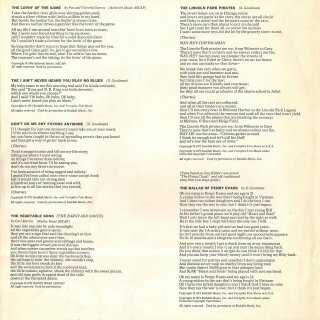 The album includes the double-sided lyrics insert. 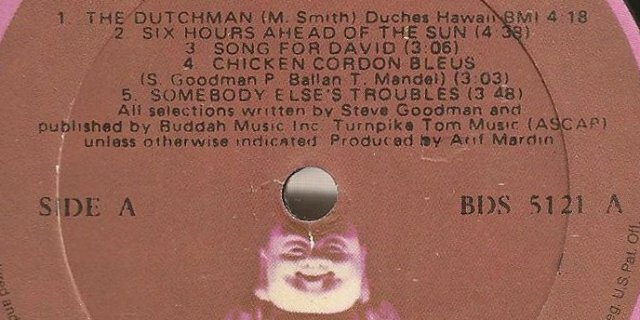 The record has unique black Buddah Records labels with silver text, still with the Shiva design and dated "1972". 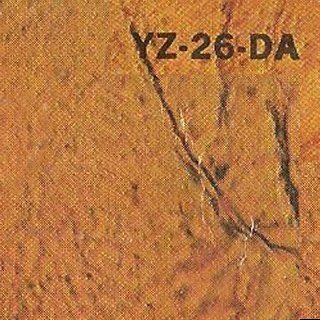 Buddah Records YZ-26-DA (Japan) - front scan by Manuel García Jara This Japanese release was made in Japan by Nippon Columbia Co. Ltd. on behalf of Buddah Records. 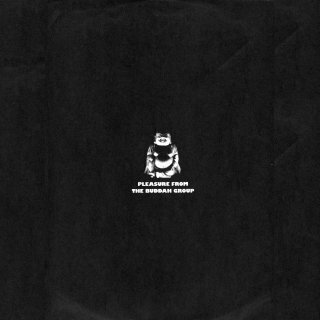 The rear sleeve has price ¥2,000. 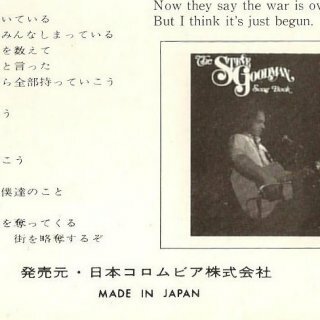 There is a four page insert with Japanese text and song lyrics in English and Japanese. The record has Buddah Records labels, but it is significant that the Shiva logo does not appear anywhere on the sleeve, the insert or the record labels. 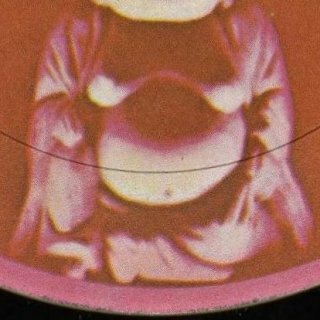 The copy shown is missing its obi - scan required! 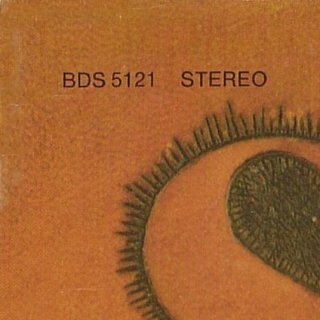 This album was first released on CD by Sequel in the UK with the bonus Dylan track Election Year Rag (R-0111, see Oct 1972 above) in 1990, and in a remastered version with two bonus live non-Dylan tracks by Buddha Records in July 1999. 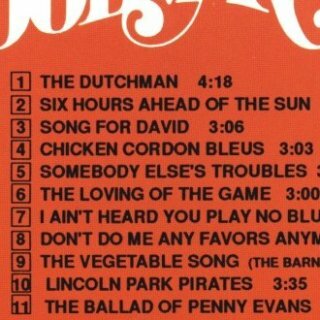 I've included the 1999 US release here because the Dylan content is the same as the LP releases above. 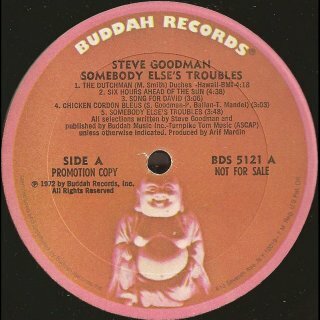 As this copy is still sealed, more scans required! 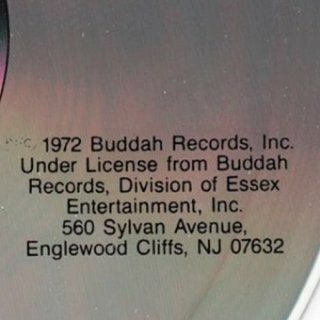 The One Way Records US CD release was released under licence from Buddah Records. 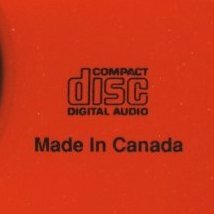 There is no date other than the original "(P) 1972" on this CD but it must have come out in the early to mid 1990s, circa 1993. 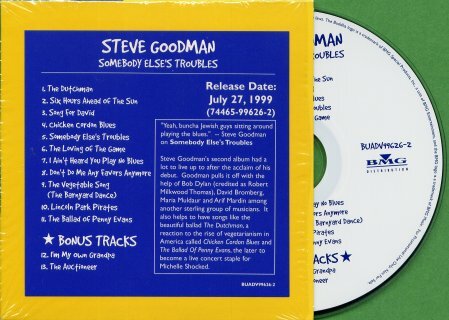 11 track album, no bonus tracks. 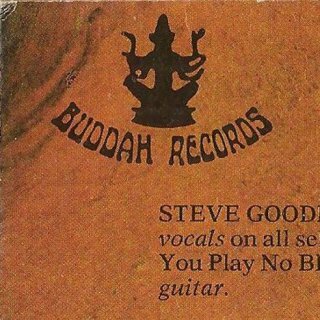 There was also a US promo CD release of the first album Steve Goodman in a blue/yellow card sleeve, Buddha Records BUADV 99625-2, listed in 1999 because it has R-0111 as a bonus track (in stereo). 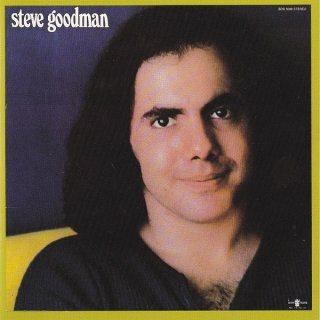 There was a CD release, NEM CD 607 (UK) - date? 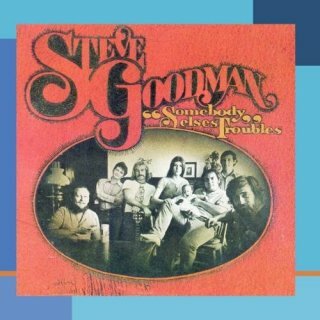 More details required!